Notes: Maya is the assistant to Dr. Akagi Ritsuko (Whom it's rumoured she has a crush on), and 2nd liutenant in NERV. What does Maya do? Well, she's basically in charge of maintaing the synch ratio between the Children and their Evangelions. It's too bad you don't get to see her personal life too much in the series, and the only times we actually do appear in volumes 5 and 6. We do know she's not a fan to the blood and violence that the Angels and Evangelions create throughout Shin-Tokyo 3. Maya is untrained in the use of a gun, and definately wouldn't shoot a real person. 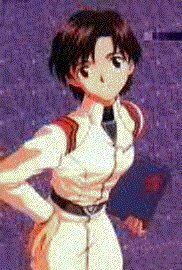 She sort of goes into a deperessive modd once Ritsuko is under arrest,and is finally reunited with her beloved sempei when Third Impact occurs and humanity evolves.